Section 71 of the Constitution Act 1852 allowed for the provision of self-governing Maori districts — as envisaged in the 1846 constitution. 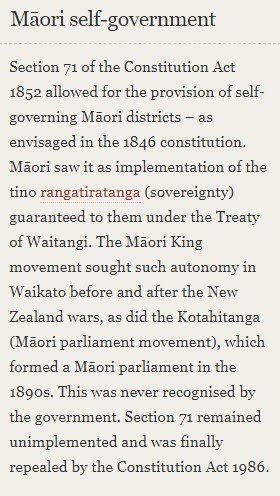 Maori saw it as implementation of the tino rangatiratanga (*sovereignty) guaranteed to them under the Treaty of Waitangi. The Maori King movement sought such autonomy in Waikato before and after the New Zealand wars, as did the Kotahitanga (Maori parliament movement), which formed a Maori parliament in the 1890s. THIS WAS NEVER RECOGNISED BY THE GOVERNMENT SECTION 71 REMAINED UNIMPLEMENTED AND WAS FINALLY REPEALED BY THE CONSTITUTION ACT 1986.